Evan Mathis, of the Philadelphia Eagles, is one of the best offensive guards in the NFL. Mathis also happens to be an avid collector. Owning some of the finest PSA-graded cards in the hobby, Mathis has built a small museum of the collectibles he loves. In the following article, Mathis shares his passion for collecting. As collectors, we all have to face it. It’s a dilemma that is inevitable. To sell or not to sell, that is the question. There are times when we can’t get ourselves to budge, no matter how great the offer is, but when does refusing to sell border on becoming irresponsible? In the following piece, PSA’s Joe Orlando discusses this issue, an issue that all collectors have to wrestle with. This 80-card set was Topps’ first basketball issue. Popular for the rookie cards making up most of the set; Bob Cousy, Bill Russell, Tom Heinsohn, just to name a few, this set has also been known amongst hobbyists & collectors to be plagued with poor centering and card defects throughout, making the goal of a high grade set difficult to attain. This collector was not deterred. With a current set rating of 8.39, (the Finest Possible is 8.64) and registered in 2003, this set has improved year after year and has earned a Set Registry Award since it was first registered. 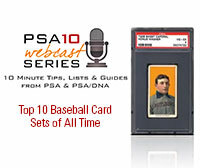 This set has also been inducted into the PSA Set Registry Hall of Fame. Click here to view this set. This is your opportunity to own a Super Bowl ring owned by one of the greatest coaches, innovators, motivators, and men in professional football history – Hank Stram. Close your eyes and you can see the nattily attired Stram patrolling the sidelines, in his navy blue blazer with a red pocket square and Chiefs spearhead logo on the breast pocket, exuberantly leading his 1969 Kansas City team to victory in Super Bowl IV. This auction features many high grade and low pop cards for collectors to complete their sets from the 1950’s through the 1970’s. Rookies include Pete Rose, Nolan Ryan, Johnny Bench, Reggie Jackson, Don Drysdale, Rod Carew, Cal Ripken, and much more. Auctions is offering 8,000 High-End Lots, Spanning all Sports and Genres, closing now through November 21, 2014. All will be sold, card by card. 1966 Topps Baseball – More than 150 PSA Cards all grading PSA 9 ending Tuesday November 11th. 1964, 1965, 1966, 1967 Topps Baseball – 175 PSA cards all grading PSA 10 ending Wednesday November 12th. Over 100 lots! ALL NO RESERVE, opening bid $.99. Featured cards in this batch include a stunning 75 Topps Mini rookie card of George Brett, graded PSA 9 and one of the nicest you will ever see AND then Ken Griffey Jr.’s best rookie card the 89 Bowman Tiffany, graded PSA 10 *GEM MT*, Junior will be a sure fire first ballot inductee next year! The November Sterling Sports Auction #37 offers over 660 lots from the four major sports plus boxing and non-sports. Includes Hall of Famers/Commons, Graded/Ungraded, High Grade/Low Grade. Highlights include 1948 Leaf Jackie Robinson, Rookie, Joe DiMaggio and Ted Williams, T206 Ty Cobb, Bat On and Off, largest single offering of T210-3 Old Mill Orange Borders, nice section of N172 Old Judges including scarce Chicago Maroons, T206s with Hindus and Piedmont 42s, 1909-11 Obak’s, 1933 Goudey, and 1961-62 Fleer BSKT. Unopened box of 1961 Nu-Card College Football with many PSA graded cards. Auction is scheduled to end November 22nd. 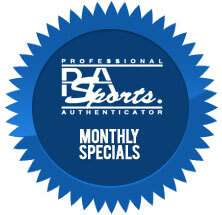 When it comes to autographs, which of the following sports has the best signers?